If you have flown to a destination either for business or leisure, you will know that flying is no fun especially when there are so many procedures and processes to go through. To make matters worse, certain airlines make it so much more difficult for you as they have all types of weird restrictions. Malaysians would be very much aware that they can now fly Air Asia, a low-budget airline as their tickets are more affordable. However, after many experiences and countless complaints, Malaysians would surely prefer to fly the national flag carrier Malaysia Airlines (MAS) instead of Air Asia for many reasons. If you can afford it, you will surely fly MAS. In MAS, food is usually provided. When it is included in the price of the flight, chances are you will not complain. In fact, it has been found that food provided on-board MAS flights are quite good. On the other hand, Air Asia charges you for every single thing you consume. While the food is not cheap, if you are unlucky, you might not even get what you want because they might have run out of stock. No doubt Air Asia has been trying to promote better food by bringing in local brands of nasi lemak and such. But the bottom line is that if you are planning to eat something on board, you need to pay for it. This is what no-frills mean. This is perhaps the biggest problems that passengers face when flying Air Asia. You only get 15kgs in a standard flight. Anything more than that would be chargeable. In fact, if you excess even 1kg, you will be charged. Paying RM100++ for a few additional kgs is totally absurd and unreasonable. In MAS, a few kgs are usually fine and there is no charged imposed. Air Asia is very strict when it comes to what you can and cannot bring into the cabin while MAS is more relaxed in every way. It must be noted though that regulations on what you can bring on board is quite standard across all airlines. On Air Asia though, they tend to restrict the number of bags you can bring and would even go to the extent of measuring them. Air Asia recently implemented a maximum of 7kg with a maximum of 2 bags permitted to bring onto the cabin. This is usually weighed prior to boarding of the flight. If your cabin bags are overweight, it will not be allowed on board. Another recent issue with baggage is that there is a highly likely chance that your baggage will be delayed. This is very common with Air Asia flights. The seats in MAS are very well maintained and larger than that in Air Asia which are small, tight and very uncomfortable. It seems like Air Asia is trying to install more seats into their planes by using smaller chairs so that they can maximise their income. On top of that, you will have to pay to choose the seats that you want, a service which is unheard of with airlines like MAS. In recent years, MAS has been venturing into some major cost-cutting measures. Some have claimed that they have been charged for choosing their seats but overall, the experience is still better. MAS flights are known to be on-time and seldom has any delays. On the other hand, flying with Air Asia is almost synonymous with delays because it happens all the time. The common reaction among passengers is that flying Air Asia will most likely have a delay. Having said that, Air Asia has been quite pro-active in trying to change that perception. While they have improved over the years, if your flight was delayed, it is still nothing new to anyone. The overall service between Air Asia and MAS differs tremendously. It is as if through Air Asia, you are being penalized for wanting cheap tickets that they treat you as if you are in a bus terminal. The queues to check-in are long despite having the online check-in facility. MAS on the other hand is a lot more convenient and comfortable. One thing for sure, you need not walk a few kilometres to get to the plane under the hot sun or the rain the way you do in Air Asia flights. This is more evident with the new klia2. You will have to walk about 20 to 30 minutes to get from the checkpoint to the gate where you are supposed to board your flight. It is a big wonder why Air Asia wins awards when they provide horrendous services like those mentioned above. Some statistics that might help you make your decision. According to surveys, Air Asia gained a smart rating of 54 while MAS has 85. This is a stark contrast of both airlines in terms of the people’s acceptance and ratings. Besides that, MAS has more seat space as compared to Air Asia which means customers are happier with larger seats. 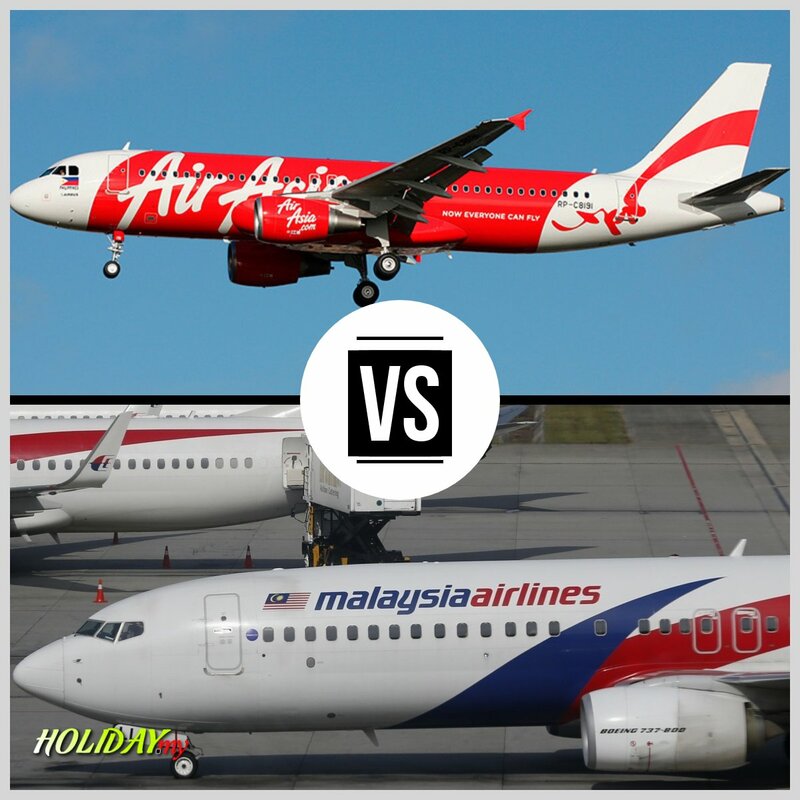 While both airlines serve international flights, MAS has more options as compared to Air Asia. MAS flies to almost all the continents in the world while Air Asia does not cover North America, Europe and Africa yet. Another factor that you might consider when choosing either of the airlines is on your baggage. If you are travelling light, Air Asia might be your best option especially if you are hand-carrying your own. If you intend to check-in any large baggage or anything more, MAS would be your choice Air Asia charges for every baggage. Ultimately, it is the value-for-money which should determine which airline to choose. Flying Air Asia is cheaper always. But do you get your money’s worth or would it be better paying a bit more for MAS but enjoying the customer experience better? You make the choice.